We'll embroider each of your names on an Adventure Suites robe. Cast your wonderful memories in cotton with a comfy Royalist Robe featuring our logo on one side and your name embroidered on the other! They will be placed in your room before you arrive along with an iced bottle of Sparkling Cider or champagne. It's a great surprise for your loved one! We offer professional, licensed massage therapy in the privacy of your luxury suite. Inspire your body with a therapeutic massage which promotes relaxation, increases blood circulation, reduces joint stiffness, facilitates recuperation, lowers heart rate/blood pressure and reduces stress and tension. -1 hour massage for one person $95 -(2) simultaneous hour-long couples massage(two masseuses): $190 -Split one hour massage between 2 people (one masseuse): $95 Note: There is a seven-day cancellation policy for massages reserved. Please let us know if there are any special accommodations you need for your massage. Please let the massage therapist know if you have any food or oil allergies. Enter your special suite and find romantic silk rose petals sprinkled around the room. The perfect precursor to a romantic evening. Why don't we offer real rose petals? 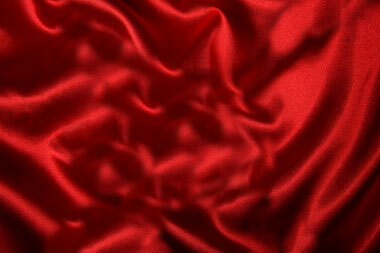 We use silk rose petals because real ones bleed and stain our sheets and room surfaces. 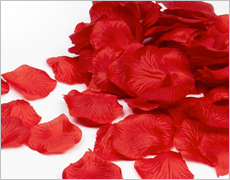 Silk rose petals give the same romantic effect without staining or damaging anything. 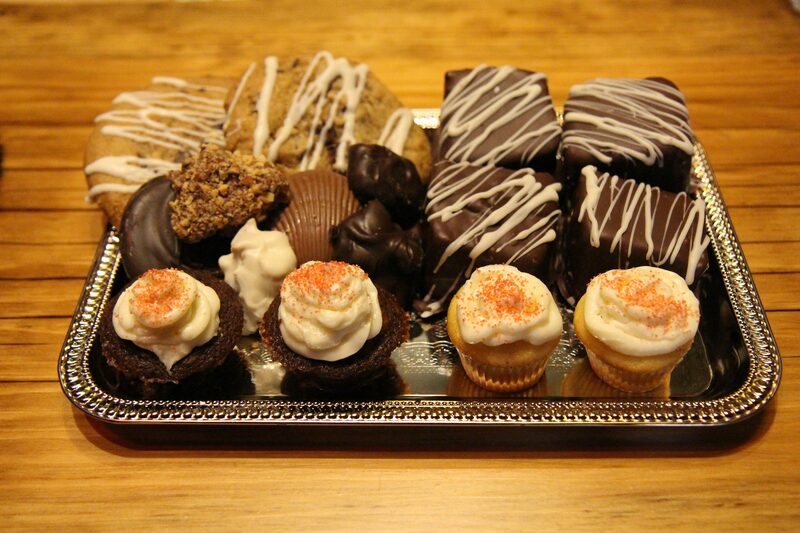 Enjoy a small platter of locally-made chocolates, mini cupcakes, bite size brownies and chocolate-dipped mini cakes in your room when you arrive. *Sweet Petite in photo is for 2. Enjoy a tasteful gift bag of adult accessories, including a DVD, exotic lotions, a romance game and bedroom toys that will add a whole new realm of pleasure to your love life. Our Most Popular Package: A Fresh Cut Rose, a Box of Handmade Chocolates, Candles, bubble bath, and a Bottle of Martinalli's Sparkling Cider or J Rogét champagne on ice—all placed in your suite before you arrive! Just ask for the Great Impressions Upgrade with your reservation. NOTE: Since bubble bath is not allowed in rooms with hot tubs (Cave, Jungle & Motorcycle Madness), extra candles will be placed in your suite. Sparkling Cider and Champagne brands may change without notice. Don't get up—We'll bring breakfast to you! 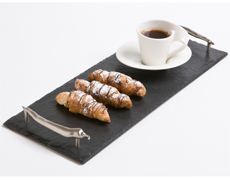 Just fill out your request form the night before and we'll deliver your breakfast to you at the time of your choice between 8am and 10am. 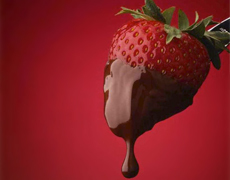 12 Decadent Strawberries freshly dipped in chocolate and served on a silver platter with a bottle of Sparkling Cider on ice and two champagne glasses. Guaranteed to make any special occasion unforgettable! What could be a better combination? 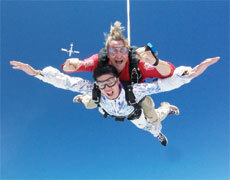 Skydive New England and Adventure Suites have teamed up to give you an experience of a lifetime! Reserve your discounted tandem jump with this highly trained group of professionals, no experience required. The tandem master will take you by the hand from start to finish. Adventure suites will arrange everything for you. Available mid-April through end of October. This includes an incognito professional photographer who will photo/video record your special moment. 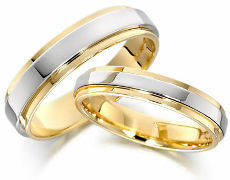 Then include posed and candid shots of the couple to remember your special event forever. Congratulations! 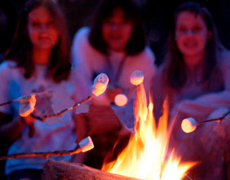 Enjoy our outdoor fire pit with a S'mores Pack. Includes one package of Honey Maid graham crackers, six Hershey chocolate bars, one bag of Jet-Puffed marshmallows and two Smorstix. Spoil your significant other by giving them a private massage inside their suite! 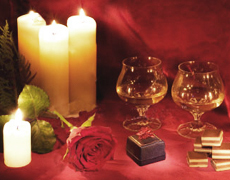 We will provide you with the table, a 3 in 1 massage candle, back massager and massage tips.